Non-enveloped, head-tail structure. The icosahedral head is about 66 nm in diameter. The non-contractile tail is about 220-230 nm in length and 13 nm in width with about 55 cross-striations. There is an extremely long tail fiber measuring approximately 200-220 nm in length. Linear dsDNA genome of 59 kb, containing about 75 genes. The genome has cohesive ends. Adsorption: The phage attaches to target cell adhesion receptors through its tail fibers. 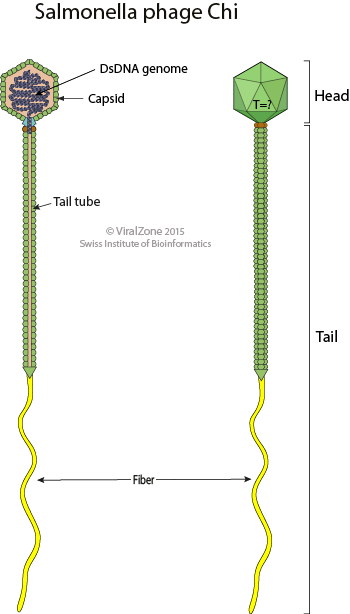 Bacteriophage chi attaches to the filament of a bacterial flagellum, but the entry receptor site is located at the base of the bacterial flagellum.